It’s difficult to measure the appreciation in property values in a small market. The average price is frequently cited, but mainly reflects changes in the product mix (for example, if high-end home buyers are more active) rather than in the appreciation in property values. The selling to listing price ratio can be used as a proxy in some situations to estimate appreciation, in this case, for properties sold in Hillier. 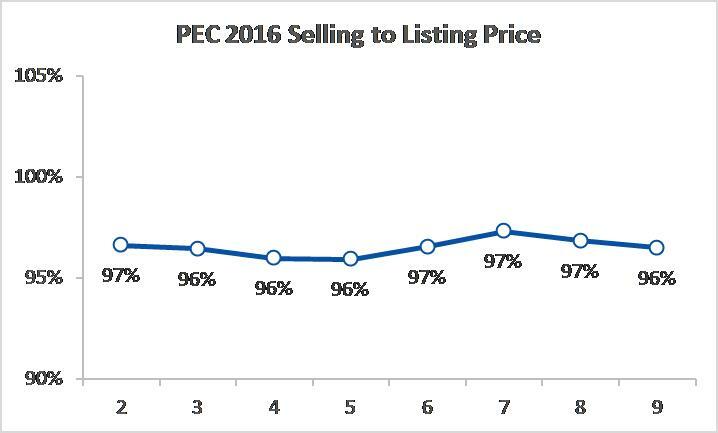 During the last 8 months, the average selling to listing price ratio for the County as a whole has been fairly stable in the 96-97% range (though this marks an increase over previous years). During the same time period, the average selling to listing price in Hillier has increased significantly, from an average of 96% in the first five months shown in line with the County as a whole to an average of 102% in the last three months. The change reflects the rise in market value compared to seller expectations when properties were listed some months earlier, in this case, we can estimate that properties in Hillier have appreciated approximately 5% in the last 6 months.